Hi my name is Susan and I am a Starbucks addict. Yes it is time to quit being in denial, admit my addiction and start my way down the road of recovery. My turning point.... realizing that I had seven rewards on my account. Do you know how much Starbucks you have to buy to acquire seven rewards? Also, I had used some of them! I was spending way to much on this nectar of the gods that I am sure saved at least three people a week from being throttled by me. But my coffee at home and work just seem so MEH compared to my venti skinny caramel macchiatto that was made with love and handed to me in that cup with the wrap designed just to protect me from the harm of burning my hands on it's glorious hotness! What is a girl to do? Then while watching tv one night I see this, like a sign from above (no, not from heaven! I live in Florida so I am sure the factory is above me on the map) But does it work? How does it taste? That cup looks very frothy and I have fell for those type things before.Those k cups that come with extras and promise to deliver a delectable cup of frothy brew that rivals that made by your favorite barista... and I have always been disappointed! I gave in..now lets try it...I made a cup of my favorite blend, sat it on the counter, shook the can, and braced my self. The force that it came out with was impressive. and let me warn you, it does not come out of the can like whipped cream. It shoots down into the cup! I was expecting the froth to come straight from the can. I mean I know it says it is creamer but I am the type of girl that likes a little coffee with her cream. 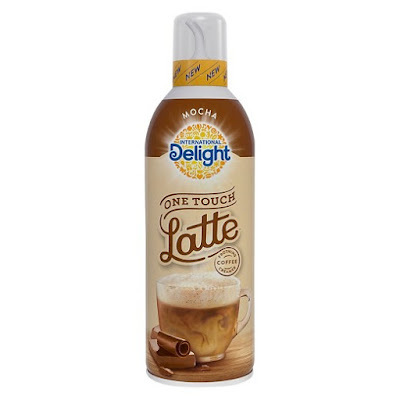 This creamer was very thick and has an amazing soft mocha taste. The froth is formed at the top when the creamer mixes with the coffee and is closer to perfection than I would think I could get from a can. All in all I am very happy with this creamer! Will it replace my starbucks in my heart? Obviously coffee made by some one else in a cup with that lovely green siren on it will always be dear to me, but I can live with this at the rate of multiple cups for what I would pay for one! I can't wait to try the other flavors offered! Currently vanilla and caramel. I am sure that if these stick around there will be a pumpkin for you fall flavor lovers!